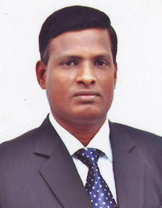 Eldest of his family Dr. T. ELANGO attended Karunya Institute of Technology, Coimbatore (presently Karunya University) to receive his Bachelor's degree with Distinction in Mechanical Engineering in 1991. He is one among the University Rank holders of Bharathiar University in his bachelor's degree. He did his Master in Design and Production of Thermal Power Equipment at NIT, Tiruchirappalli in 1999 and earned his Ph.D in Automobile Technology from Bharathidasan University in the year 2011. He is a teacher in Engineering since 1991 and carries academic and administrative experience of about 25 years. His technical career contributions have been in the areas of Internal Combustion Engines, Biodiesel Combustion and Emissions and Tribological studies on Diesel Engines. He has published over 20 research papers in various reputed International and National Journals and Conferences. Currently he is guiding 4 research scholars, He is recognized as a reviewer in two peer reviewed International Journals such as Environmental Technology and Journal of Engineering Science and Technology. He has provided guidance for more than 40 B.Tech and 10 M.Tech student projects. He is a mentor for the project on "Performance optimization of a single cylinder diesel engine fuelled with biodiesel" which is funded by Department of Science and Technology. He has attended more than 50 Faculty Development Programmes, and has delivered many Guest Lectures, Invited Talks and organized workshops at National level. He has held responsibilities in key positions in organizing International Conferences. As a member of the team he has demonstrated his rich academic, research and administrative experience to obtain National (NBA), NAAC and International (ABET-USA) Accreditations. He is a life member in ISTE and Institution of Engineers, India.